Businesses are under pressure to modernize and go digital, putting IT organizations squarely in the spotlight. Data protection has never been more in the forefront, as information increasingly is the lifeblood and differentiator in a constantly changing world. 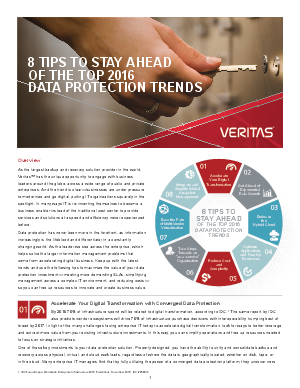 Read this paper to keep up with the latest trends and learn eight tips to maximize the value of your data protection investment, so you can free up resources to innovate and create business value.